Among the numerous books on the topic, there appears to be a consensus that energy healing is a holistic approach that includes physical, emotional and spiritual aspects. Although authors discovered different techniques to enhance the energetic healing process, they often reference some type of indigenous healing traditions, folk medicine, esoteric mystical traditions or ancient Eastern theories of medicine. At the same time, the advance in understanding that was consistently referenced was the shift from Newtonian to quantum physics: the world learned that everything is energy. One acclaimed practitioner, teacher and author of energy healing, Barbara Ann Brennan, became interested in energy healing from her career as a research physicist for NASA and years of training in physiology, anatomy, bioenergetics counseling, massage therapy, homeopathy, core energetics and more. Her first book, Hands of Light: A Guide to Healing Through the Human Energy Field (1987), drew from her personal experiences, her work with clients and scientific studies in the human energy field. The book focuses on releasing stuck creative energy, which Brennan considers the core problem, through work with the chakras and auric fields. In her next book, Light Emerging: The Journey of Personal Healing (1993), she guides the reader through the seven stages of healing. The second half of the book is devoted to the importance of healing relationships as a part of personal healing. Her recent work, Core Light Healing: My Personal Journey and Advanced Healing Concepts for Creating the Life You Long to Live, offers a wealth of self-healing exercises. The second half of the book is an exploration of the astral world—the fourth layer of the human energy field. Brennan devoted many years to studying the human energy field and expects much from her students. In her books, she emphasizes that learning to do energy healing, for oneself or for others, is not just a mental process of learning but also requires a hands-on approach to experience the subtle energies involved. Energy Medicine: Balancing Your Body’s Energies for Optimal Health, Joy, and Vitality by Donna Eden with David Feinstein, first released in 1998, is another classic in the field of energy healing. A 2008 edition reflects the growth of energy medicine and its acceptance as complimentary to conventional medicine. It provides detailed illustrations of the acupressure points and meridians based on traditional Chinese Medicine. Eden integrates the process of healing the energies of the seven chakras with exploring the life experiences the patient has absorbed into their energy field. Finally, she offers information on how the Five Rhythms, elements or seasons, as described in Chinese medicine, influence the chakras, auras, meridians and other energy patterns, adding another layer of understanding to energy healing. 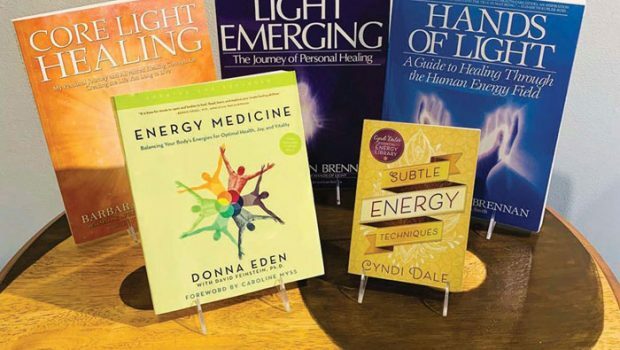 In her book Subtle Energy Techniques, Cyndi Dale, another prolific author in the field of energy healing, shares information about, and exercises from, several of her healing techniques, including her Spirit-To-Spirit personal process and Healing Streams of Grace. The Spirit-To-Spirit process guides the reader to affirm their personal spirit, other spirits—both worldly and other-worldly—and finally, The Spirit. Healing Streams of Grace guides the reader to work with the beautiful healing streams of grace that are all around us. Candace Apple is founder and owner of Phoenix & Dragon Bookstore in Atlanta, which offers a broad selection of holistic and spiritual merchandise as well as classes, workshops, readings and more. Reach Candace at Candace@PhoenixAndDragon.com. Candace Apple Candace Apple is owner of Phoenix & Dragon Bookstore, 5531 Roswell Rd NE Sandy Springs, 30342, 404-255-5207. Candace@PhoenixAndDragon.com.